Flash fiction posted to blog on November 7, 2013. I want to make it clear that this is NOT MY FAULT. My friend @jenphalian held a gun to my head and MADE me do this. AGAINST MY WILL. Anyway, there’s this new, um, thing, available for free download. Any complaints should be addressed to her. My Firefly novel, released under a creative commons license. You are free to download it and share it with your friends as long as it is not used for commercial purposes. Thank you for posting these. I can’t wait to read it. I want to thank Jen and you for Paarfirotica. I’ve been spending a few hours looking at some of the underlying documentation on the Steubeville debacle. I fully realise that my passionate interest in underlying documentation may seem exceedingly strange, but we can discuss that at another time if anyone wants to. But having read the wretched stuff I also realised that I desperately need a reminder that the term ‘making love’ actually means ‘making love’, and that making love frequently involves laughter. I found that reminder with Paarfi, and I’m very grateful; life looks a great deal better than it did. So thank you! You are more than welcome. It is a pleasure to do exactly what you said I did. That’s what it’s about for me. So thank you. This makes me extremely happy. Dare I say smüg? I believe I shall do myself that honor: I am smüg. So, is that why you knew the character ü, or are you now making evil use of knowledge otherwise gained? Just wondering. I used to know it for smüg purposes and then forgot it but looked it up again just for Dühring. This time I might remember forever. Here I am, looking for the Khaavren Romances I loved so much, and stumble across this…This interesting piece of literature titled Paarfirotica. I am only curious as to the conversation that led to this wonderful piece of writing. Jen: You must write this. This is a COMPLETE LIE; I have a .380. Shiny! Thank you for sharing it! I’m pleased you enjoyed it; thanks for letting me know. Pingback: Fanpocalypse Now | Stefon Mears' Blog — Raven Tested, Coyote Approved! I just finished the novel. Loved it. You pegged the characters nicely. At least, for me. Really a fun read and reminded me how much I loved the series and wish they’d at least put out novels. On the one; thank you for this excellent piece of work. Reading it has made my life a bit brighter. On the other; for shame sirrah! You should be taken out back and beaten with thorn bushes. I leave it to the student to determine which statement goes with which story. Thank you for sharing this novel. It was like someone dug out a lost episode. Excellent work! Just read My Own Kind of Freedom. Prepare for gushy and extreme hyperbole. I thought it was outstanding! With the exception of one sentence I think you had the dialog pitch perfect. You could totally write script for Whedon, in my opinion. I also loved the exposition of Wash’s piloting and River’s … well, the inside of River’s head. Thank you so much for sharing! Oh, and BTW, I also have a bunch of Vlad, and you’ve reminded me to check; I think I’m behind on my collection. I need to fix that. You should talk to Whedon…I think that if you ever get to the point of taking a hiatus on the Dragaeran stories, you get Firefly as well as anyone. Perfect. 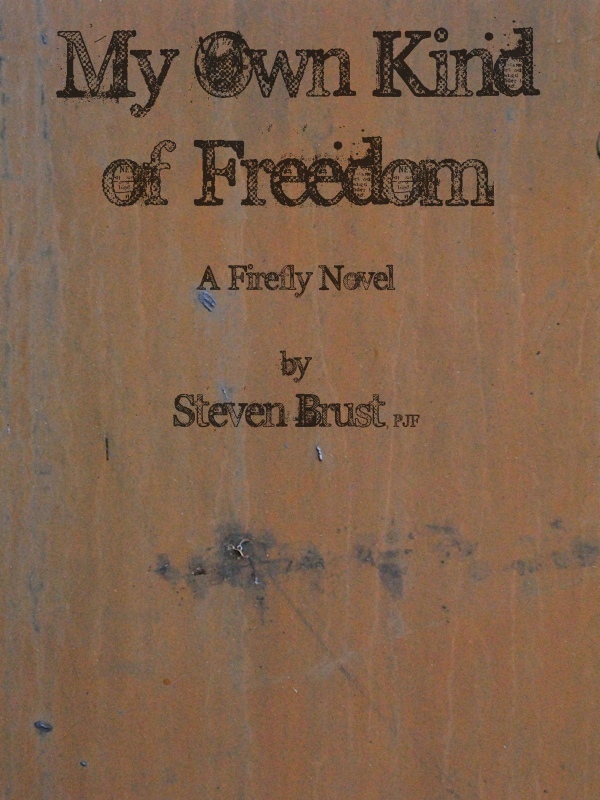 “My Own Kind of Freedom” by Steven Brust is a good read and I want to thank the author and to encourage him to write more. The stories characterisation of River. The television episodes presented River as a mystery but kept giving us just enough information to make it an interesting mystery and build up affinity and sympathy for the character. In Brust’s story he gives us a glimpse at how River thinks and why she says the things she says. Brillant! Clearly defined bad guys, good guys and a few in between. The story was both simple but had enough twists to keep me guessing as to how the heros would pull through. Well written with good detail and a clear ending. The character of Kit Merlyn. The crew of Serenity is a good example of a dysfunctional group. Each has their own goals and motivations that often are at cross purposes yet they still work well together. That’s what makes stories about them so interesting. In Brust’s story the character of Kit Merlyn fits right in with them. He has an interesting background, a touch of mystery and a sense of ethics that could either be seen as black, grey or white depending on who looks. Brust’s characterisation of Captain Reynolds. Brust did something interesting and deliberately altered Mal for and as part of his story. I admit this change did add to the story but it’s not how I like to think of a larger than life hero. I applaud Brust for this literary experiment but I don’t like seeing the hero with feet of clay. Just my opinion. Some of the crew were just a bit too much in character. Each character seemed to have a need to get in the last word which means long dialogs between them. I understand that Michael Straczynski, who wrote Babylon 5, once spent hours and hours working to cut dialog from one main character until there was only one word left. It was the time and place of when that one word was said that made whole episode. If you’re a Brown Coat I encourage you to read this story and tell me why I’m full of it. Superior Firefly novel. You know the characters extremely well – that’s who they are thats how they behave. Very enjoyable edge-of-your-seat reading. More please! Thanks kindly. I’m glad you enjoyed it, and it was good of you to take the time to say so. Just started to read “my own kind of freedom”, and I must say it is undoubtably a work of art, feels just like the series, my gratitude, and i hope you will continue to write. I never noticed that picture before, probably because I hadn’t noticed the downloads page, having gotten Paarfirotica and MOKoF from the relevant blog pages when they were initially posted. I assume you posted this picture to make clear to us all how glamorous is the life of a famous author. Bravo. “Knocked on the head” and “slant”. You’ve been reading O’Brian for a while now, I see. Mh. Well, thanks to you, I also will be yet again. Oh, well; could be worse. I’ve now got a volume of Holmes pastiches that can go back on the to-be-read shelf. Thank you for the opportunity to go into the Firefly world again. Very enjoyable and you nailed the characters – especially River. I would not be disturbed at all if you wrote another one. Thanks kindly; glad you liked it. Just wanted to drop by and say thanks for the releasing the Firefly novel and making it so easy to acquire. I was excited when I learned you had written one and enjoyed it very much! You’re most welcome. Glad you enjoyed it. I would like more of this. The whole feel of Firefly was captured. You have a very good book. I think you are a genius in his field. Thank you! From Russia with love. Next book? I’m not greedy, you understand, merely opportunistic. Next book? Working on Tsalmoth. The next one out, next September, will be The Baron of Magister Valley. September of 2020? Okay, I can wait that long. Like I have a choice! September 2019. And I am with child to see the cover art. And now Amazon claims it’s been moved back to December. Adding to my birthday wishlist. In our eyes, individual terror is inadmissible precisely because it belittles the role of the masses in their own consciousness, reconciles them to their powerlessness, and turns their eyes and hopes towards a great avenger and liberator who some day will come and accomplish his mission.